me:....*annoyed*...ok..*follows*..thinking...AHHHHHH..I KNOW HE IS TRYING TO DRIVE ME CRAZZY!!! !...WHY DOES HE KEEP DOING THINGS TO IRRATE ME!!!!! me:....*annoyed and goes and stands by a wall with my back to it and cross's my arms*....thinkng.....great...this is great!!!! !......I wounder how this party is going to turn out....my student's might becoming....how annoying!!!!! me:*standing against the wall with my back to it and my arms crossed*...thanks naruto....thinking...ok is he blushsing?!?!?!?!?!?!?!?! ?..awww man I don't want little boy fanboys!!!!!! [me]hello girls.this is my sister ayumi.introduce urselfs 2 her. [kimko]*bows*hello ayumi sensei.im kimiko nakamori. alacord:*glares at kaze*...WHAT ARE YOU LOOKING AT MORON!!!! kaze:*glares at alacord*...SHUT UP YOUR THE MORON, MORON!!!!!! me:*huge anime vain and growls*...DAME IT ALL TO HELL!!!!.. *disapears and reapears quickly near them and pulls them apart by thier collors and lift them in the air and growl and glare at them*...WHAT DID I TELL YOU TWO!!! !..THIS IS NO WAY FOR FUTURE HIDDEN LEAF NINJA TO ACT!!!! !....YOU TWO ARE TEAM MATES, ACT LIKE IT......NOW IF I HAVE TO KEEP PULING YOU TWO APART YOU WILL HAVE CONSCNES FOR YOUR ACTIONS AND YOU WILL BE PUNISHED...IS THAT CLEAR!!!!! [me]*stands by u with my hands shoved in my dress pockets*thank u but ur the 1 that took care of them and helped get them this way.u and there parents that is.i just got them so they dont have anything from me yet iruka. [me]*stands by u with my hands shoved in my dress pockets*yea sure. [kakashi]no..i have 1 hard a$$ that IS a show off and the just a show off,and a boy crazed girl. naruto:*a big goofy grin and answering the door*...HI GAI SENSEI, HAY BUSHY BROWS!!! gai:*walks over to us and does his pos and flashs a bright shiny teeth smiles*....hi kazuki and ayumi...hows two beauitful ladies doing today???? me:*twitchs*...AHHHHHHHH MY EYES...DON'T DO THAT GAI!!! !....if you must know dandy!!!!! me:*twitchs*...AHHHHHHHHHHHHHHHHHH MY EYES ITS A MINNIE GAI....*twitchs more*....DON'T DO THAT KID!!!!!!!! !.....MY EYES HURT!!!!...thinking..WTF?!?!?!?!?!?!?!?!?!?!?!?!?!?!?!?!?!?!?!?!?! ?..I THINK I DIED AND WENT TO HELL.....AH SH*T IF THIS IS HELL THIS IS PURE TORTUER!!!!!! me:*twitchs*..STOP LOOKING AT ME LIKE THAT URG!!!! [lee]*follows gai and does the pose with him*but this pose is so youthful!!! me:*twitchs more*..AHHHHHHHHHHHHHHHHHHHH I SAID STOP DOING THAT!! !..THERE IS NOTHING YOUTHFUL ABOUT IT....GO AWAY YOUR HURTING MY EYES......thinking...AHHHHHHHHHHHHHHHHH WHY WON'T MINNIE GAI GO AWAY?!?!?!?!?!?!?!?!?!?!?!?! ?....HE LOOKS LIKE HIS MONSKIN VERSION!!!!! iruka:..go away gai... why don't you go do something else!!!! iruka:*annoyed and lightly blushing about you*..shut up gai..go away!!! [me]*stands by u with my hands shoved in my dress pockets**twitch*and wut the hell is that suposed 2 mean gai? ?u talking as if they liked us.besides whos says were gonna get with u!?!?! [lee]*follows gai and does the pose with him*but gai sensei is youthful and hes doing it!! me:*twitchs more*..thinking...GO AWAY FREAKY BUSHY BROWS JUNUOR!!!! [me]*stands by u with my hands shoved in my dress pockets**twitch*do u wannt me 2 make so u'll never b able 2 have children?? [me]*stands by u with my hands shoved in my dress pockets**twitch*yea i no and hes every bit as annoying!! me:*twitchs more*....I wish gai would give up...he will never be a guy we like to date....he's umm ok I'll say it werid for me and I know the same for you kazumi.....he can be nice but still whats up with youth????? [me]*stands by u with my hands shoved in my dress pockets**twitch*yea i have a funny feeling about 2night..
naruto:*smirks and standing in the middle of the room*....EVERYONE WERE GOING TO PLAY A GAME AND THE SENSEI'S WILL BE PLAYING THE SAME GAME BUT WITH SENSEI'S ONLY.....WERE PLAYING 15 MINUTES IN HEAVEN!! other half:*smiling*...YES 15 MINUTES IN HEAVEN!!!!! me:*twitching*....HELL NO!!! !...DAME IT....KILL ME NOW!!!!! !..WHERES A ROUGE NINJA WHEN YOU NEED ONE!!!!! [me]*stands by u with my hands shoved in my dress pockets*WUT!?!?!?!? me:*twitchs more and mumbles*...F*CK!!!!.. *holds the papper and twitchs and slowly opens the papper and shock goes across my face*..WTF?!?!?!?!?!?!?!?!?!?!?!?!?!?!?!?!?.....KAKASHI!?! 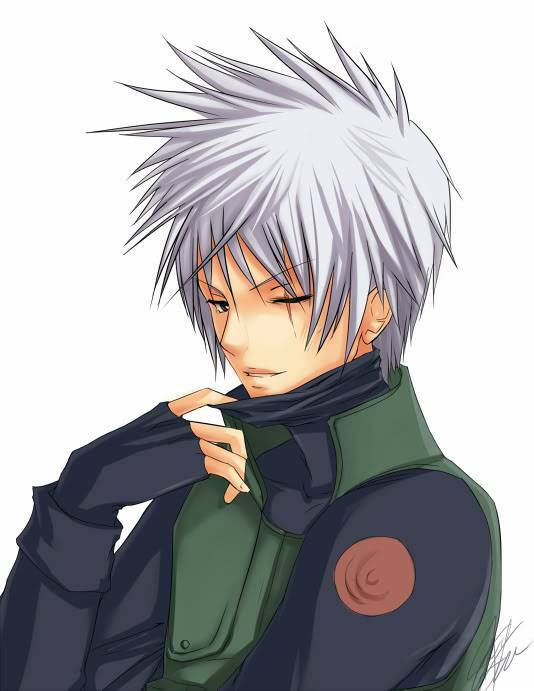 me:*glares at kakashi*...DON'T GET ANY IDEA'S!!!!.. *stroms off to the closet and walks in and stands in the corner of the closet with my face facing the wall and mumbling*..F*CK NOW I'M STUCK IN THE CLOSET WITH THE PERVERT COPY CAT NINJA!!!!!!..URG!! !...HE BETTER NOT THINK HE'S GETING ANY WHERE WITH ME HE'S DREAMING!!!! me:*facing the wall leaning against it and twitchs*.....WE HAVEN'T EVEN BEEN IN HERE FOR 5 SECONDS AND YOU AREALREADY TRYING TO DO..I DON'T EVEN WANT TO THINK ABOUT WHAT YOUR TALKING ABOUT WHAT YOU WANT TO TRY AND DO....DON'T TRY ANYTHING KAKASHI THE PERV!!!!....HMP!!!! [kakashi]*lightly blushing about u and sighs*im not that big of a pervert...i ment my face...i want 2 show u wuts under my mask...both of them..
well?wut do u think?do u like it better then u would've thought u would?? me:*shocked and my heart racing faster and my face turing a deeper blushs and feels more buiterflys in my tummy as kakasi kisses me*..thinking..WTF?!?!?!?!?!?!?!?!?!?! ?...WHY AM I FEELING THIS WAY AND WHY WOULD HE WANT TO KISS ME?!?!?!?!?!?!?!?!?!?! ?.....BUT IT FEELS SO GOOD.......*trying not to enjoy him kissing me*...URG GET HOLD OF YOURSELF AYUMI!!! !..HE'S A PERVERT THATS WHY HE IS DOING THIS!!! me:*quickly pulls away and slaps him across the face glaring at him with a huge blush across my face*..WHAT DO YOU THINK YOU ARE DOING YOU PERVERT?!?!?!?!?!?!?!?!?!?!?!?!?!?! ?..IF YOUR THINKING YOUR GETING IN MY PANTS YOU GOT ANOTHER THING COMING!!!!!...HMP!!!!.. *turns toward the wall blushs bright red*......thinking..why didn't I stop him sooner!?!?!?!?!?!?!? !